Categorization and the assigning of meaning to things are a basic feature of life. It is something that everyone does. What is always missing and rarely considered however is the fact that although we are always compelled to categorize and divide and assign, the categories that we create are never universal, they always change. We find the truth of our lives and the secrets that our communities refuse to acknowledge in the way in which those categories are born and the way they are maintained. Categorization can start in the family, but is something taken up in society as well, in particular during schooling. We see meaning and value assigned to certain things and we understand, usually implicitly, that the functionality of these categories is dependent, to borrow from Foucault, on a particular order of things. Categorization inevitably leads to hierarchy, as the world does not only become divided, but stacked and associated. That which seems to rise higher into the sky and that which sinks low and is stuck into the ground. Once again there are no universal qualities to these aspects of meaning. But people will cling to those that they are accustomed to sometimes out of simply convenience, other times out of sheer terror. Breaking down those boundaries, even if they may hate them, could unleash a torrent of unexpected meaning, new identities, new obligations, new forms of security and new forms of insecurity. We can see this in everything from what people are comfortable eating to what they see as being trustworthy in organizing their lives. Why is it that people in certain countries find it so offensive to eat certain animals, such as dogs? Why is it that in certain culture certain meats are naturalized as being normal whereas others aren’t? How is that one culture can be considered to be fine and sophisticated for eating snails and others are not for eating dogs? How do these forms of categorization then come into play where certain groups become marginalized or considered to be unnatural or obscene because of their transgressing of said categories? These sorts of displacements need not be so stark as if only between those of different countries or continents. It can be found in the simple ways that people organize their families. The locus of stability within a family changes depending on culture, and this becomes a site for stigmatizing others who organize their family differently. Within the United States for example, non-whites in particular Latinos and Blacks were regularly argued to be deviant or abnormal because of the way their family structure was different than some mythical and stereotypical White family. Latinos were argued to have deviant families because the women were too powerful. Blacks were argued to be abnormal because they had too many strange mixes of people living together, some of whom were referred to as relatives but weren’t actually blood related. While I was living in the states for graduate school there was a theater in Long Beach that I would sometimes visit as they specialized in Bollywood movies, a genre I was very addicted to at the time. I am used to the prices of tickets at movie theaters being determined by your age or by your social status (student or military). For that theater the ticket price depended upon your height. If you were under a certain height you were assumed cheaper than someone taller. An interesting reminder of how things that may be accepted as normal or natural before us, can shift slightly or dramatically, and what can result in terms of disruptions and eruptions of meaning as a result? This is one of the reasons why certain acts of resistance can cause far more than we met be able to imagine. In the infamous fence jumping example of Angel Santos and Nasion Chamoru, in one universe of meaning that act might have little impact. All they did was hop over a fence. They got arrested afterwards. For many people, they don’t even know what they were protesting, what they were so upset about. They still don’t know and it doesn’t even matter really. 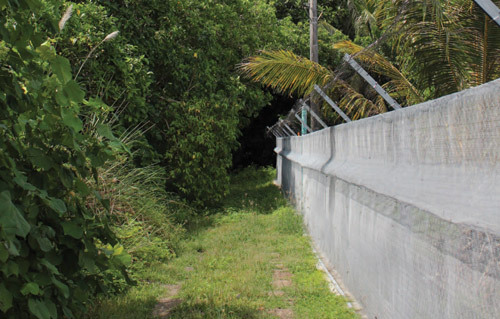 The act became so notorious that it ended up shifting the very meaning of military fences on Guam. Nasion Chamoru and other land rights activists had been challenged the fences of the US military for years, attempting to deny the security of meaning and the boundaries they seemed to create. What was behind the fences belongs to Uncle Sam and it is not to be touched, to challenge the fence means to tear down the order the fences create. To do away with security, safety, prosperity, all of these things the US and its presence is supposed to guarantee. The act of Nasion Chamoru hardened the resolve of some in terms of tying their identity to the fence and to the notion that it should not be touched or challenged. But their act also helped open the space to see beyond the fence. To see the way the land stretched beneath it. The way genealogies stretch beneath it. To take away the seemingly invincible and temporal teleology of the fence, and see it has been a recent way of dividing the island, and one which has created a hierarchy, a balance in which the native people of Guam have been shut out of much of their island and continue to have much held away from them. Tags: anghet, black, bollywood, boundaries, deviant, familia, fences, foucault, Ideology, kollat, latino, mubi siha, Nasion Chamoru, natural, tiyan. Bookmark the permalink.